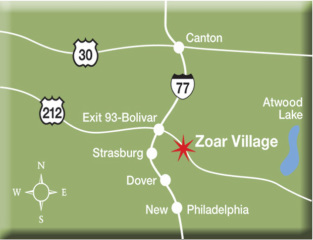 Historic Zoar Village is conveniently located just three miles east of I-77 on Ohio State Rt. 212. Just 20 minutes south of Canton. While in Zoar, visit any one of the Ohio Historical Society's 10 museums, or browse through the many antique shops, or simply immerse yourself in the past in the 12 block historic district.